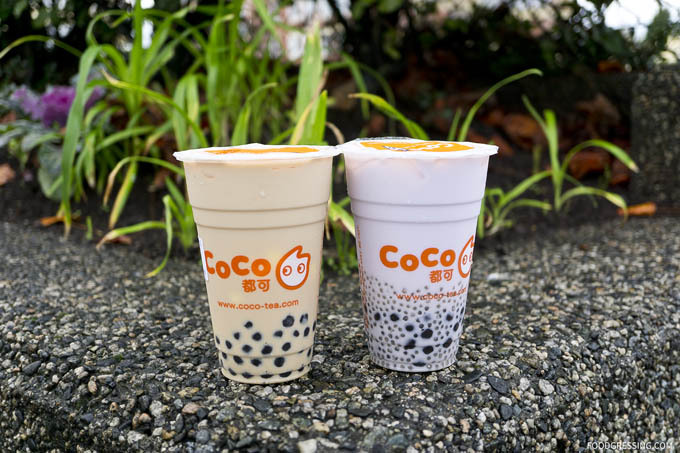 With over 2,000 locations worldwide, CoCo Fresh Tea & Juice is one of the largest bubble tea franchises in the world. 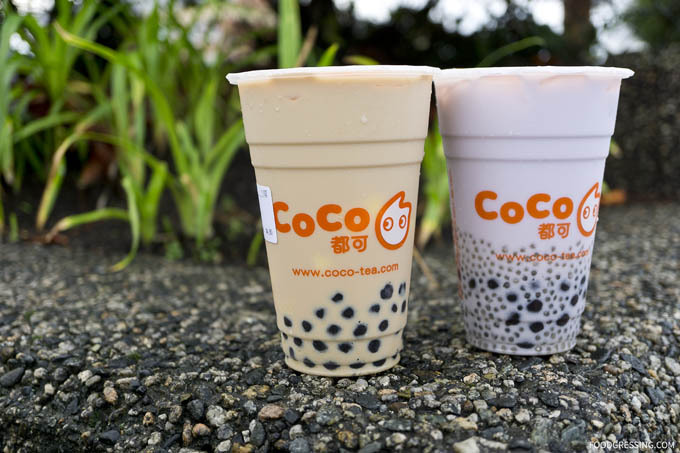 Founded in 1997 in Taiwan, Coco claims to serve 100 cups of bubble tea every second – now that’s a lot of bubble tea! 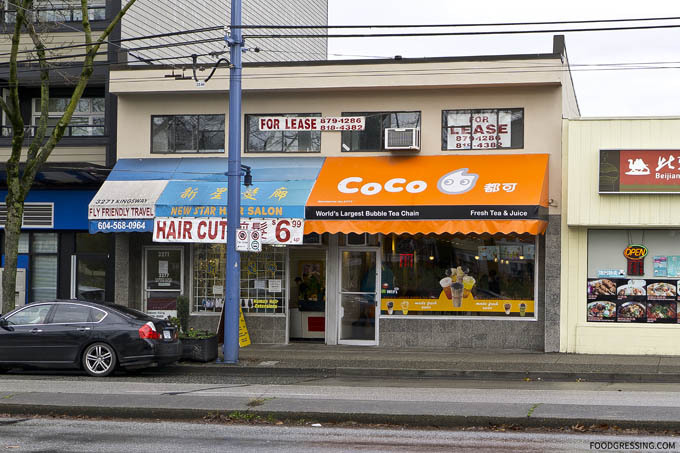 Coco Fresh Tea & Juice made their debut into the Vancouver market earlier this year with the opening of a store at 3275 Kingsway. 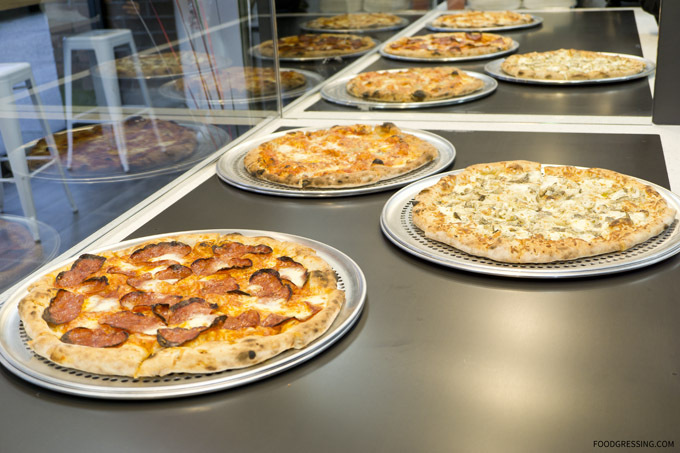 Following that, they opened a second location in Downtown Vancouver. 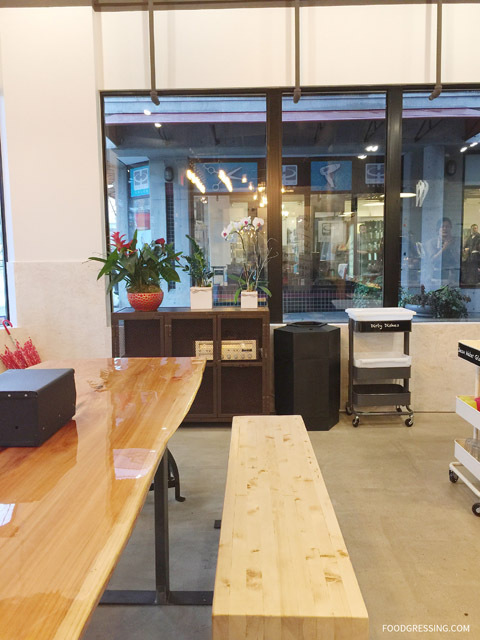 I have visited the Downtown location several times now (see post here) and in general I think their bubble tea is pretty good. On the way home from Metrotown today, I decided to pick up some drinks at their Kingsway shop. 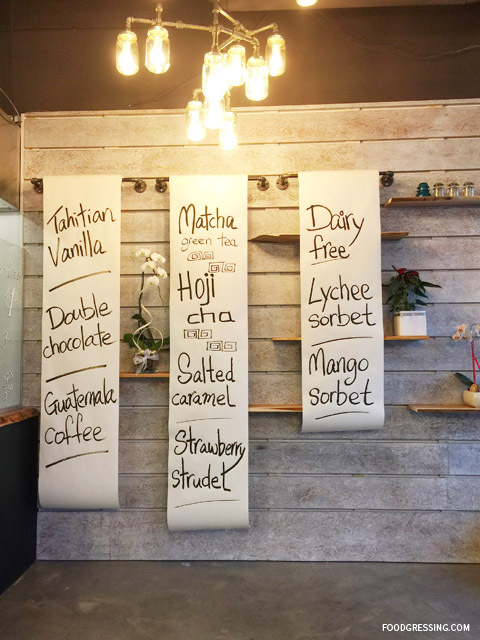 CoCo Fresh Tea & Juice serves authentic Taiwanese bubble tea, milk tea, latte, smoothies and juice. They have two sizes available: regular and large. 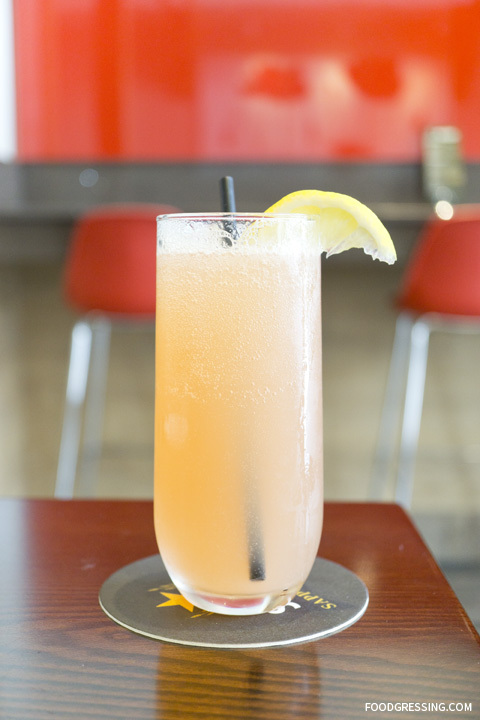 Drinks are mostly priced between $4 – $5. You can also customize sweetness and level. To ensure the freshest drinks for customers, Coco ensures that tea is brewed and kept for up to 3 hours. Tapioca is made and stored up to 4 hours. All ingredients and equipment are shipped directly from Taiwan. This location is cash or interac only. 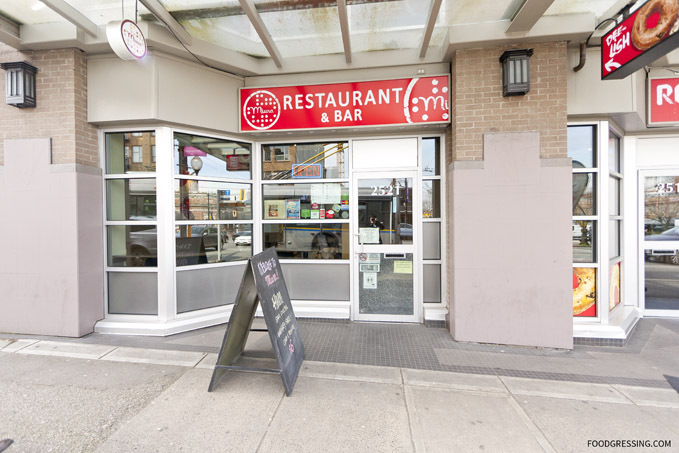 While the Downtown Vancouver location is small and better for take-out, the Kingsway location is more spacious and accommodating for eating in. They have a variety of dining tables and a counter by the window. I’m a regular of the 3 Guys with a classic milk tea plus three different toppings, but this time around I noticed that they have 2 Ladies ($4.10). I got a regular sized 2 Ladies which has just two toppings (pearl and pudding) in milk tea. The second drink I got was one of their recommended drinks: a sago taro milk tea with pearl in regular size ($5.10). The drinks from Coco Fresh Tea & Juice Kingsway today seemed to have a stronger tea flavour than ones I had from the Downtown location. The tapioca pearls were also particularly good: smooth and slightly soft on the outside, but chewy through to the middle with a slightly increasing level of firmness. The sago was also very tasty: jelly-like, chewy and refreshing. Disclaimer: All food in this review was complimentary. Opinions are my own. 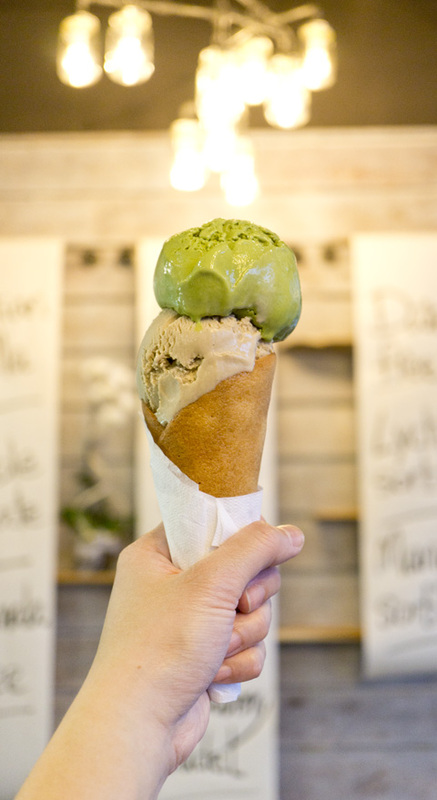 Miura’s story began in 2010 when Dennis and Jenny Muira started Miura Waffle Milk Bar in Downtown Vancouver. 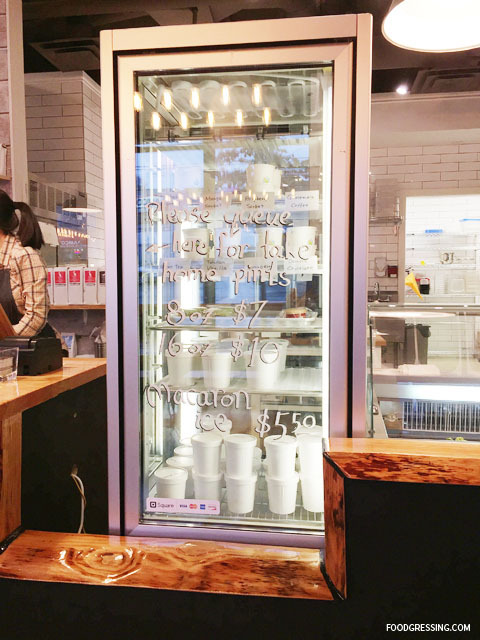 They quickly became a must-try eatery with their signature Waffle Sandos, a delicious Asian-inspired waffle sandwich that left diners lingering for more. The Waffle Sandos was so good that it was even featured on the Food Network’s “You Gotta Eat Here!” Now in their Mount Pleasant location, Miura is offering an exciting new menu with inspiring eats that extends beyonds waffles. 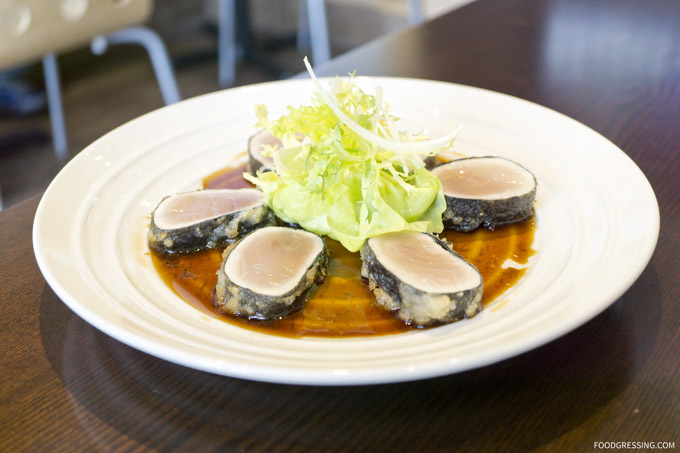 Miura’s updated menu features interesting fusion dishes with influences from Japanese, Italian, French and Pacific Northwest cuisine. 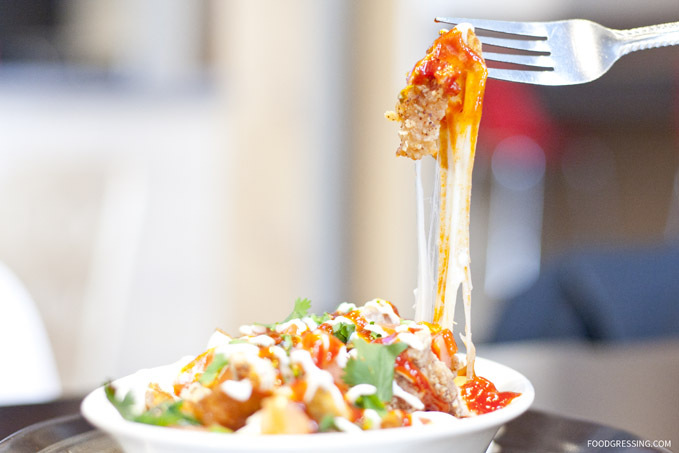 Some of their comfort eats include Korean poutine, Char-Siu pork tacos, cheese gyoza, fried chicken donburi to name a few. Also featured are sake cocktails, signature cocktails and beers that make perfect pairings for their dishes. Their menu is fully available on their website. To start, the tuna nori carpaccio ($12) was simple, light and delicious. I really enjoyed the presentation of the dish with the perfect arrangement of the tempura fried albacore tuna pieces on the lemon ponzu sauce. 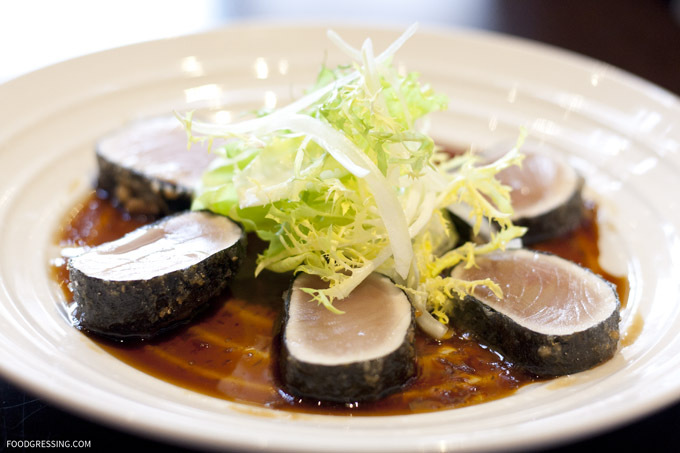 I love albacore tuna and this dish was most definitely on point. The tuna was scrumptious and the sauce was wonderfully zesty. As a lover of poutine and Korean food, I felt that I needed to try Miura’s Korean Poutine ($10). 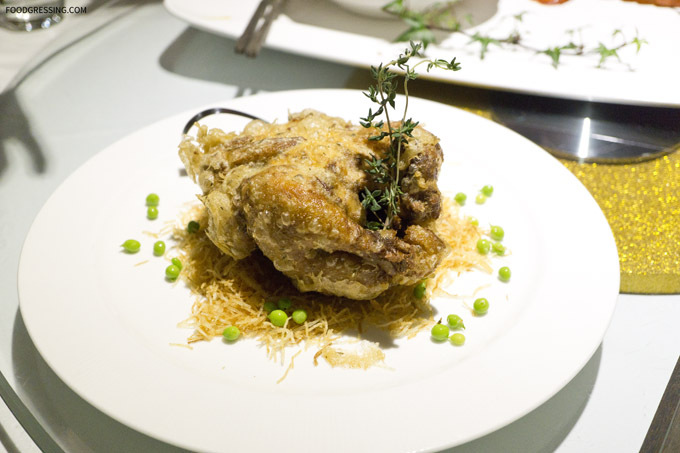 Rich and flavourful, this dish did not disappoint. It was quite a comforting dish with shredded chicken, tomatoes, mozzarella, cilantro, green onion, sour cream, and Korean spicy sauce. 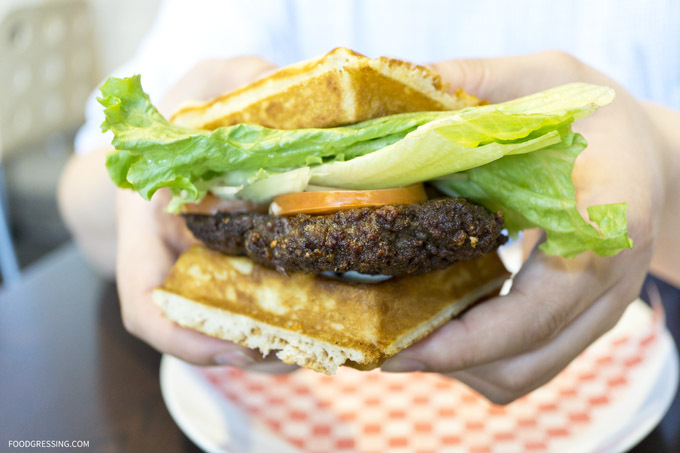 The waffle burger ($11) is a definite two-hander. It’s a mouthful of goodness with a juicy 6 oz beef patty, lettuce, tomato, mayo and teri sauce. The waffles were crispy on the outside and fluffy on the inside – stuff that dreams are made off. This is good and I would recommend it. 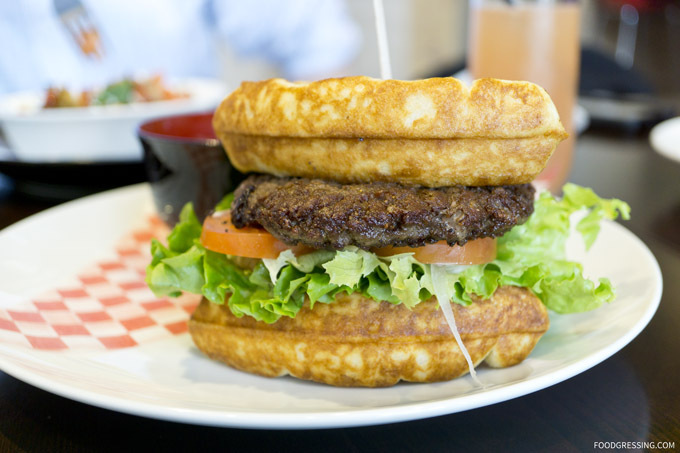 The soup of the day came with the waffle burger. It was a creamy mushroom soup which had a wonderful flavour. The star of the meal was the udon alfredo ($11) with shitake and button mushrooms in a white miso sauce. Jenny had noted to me that this was a very popular dish and rightfully so! 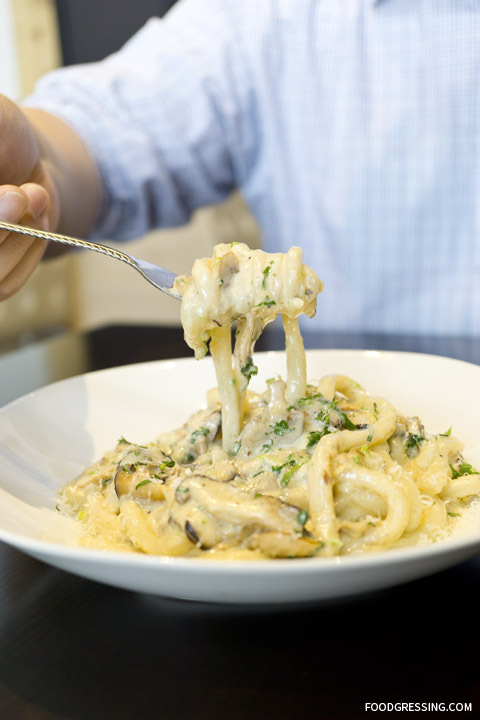 I was in love with the chewy udon noodles and the alfredo sauce was flavourful, creamy and delightful. I was scrapping the bottom of the plate because it was so good. 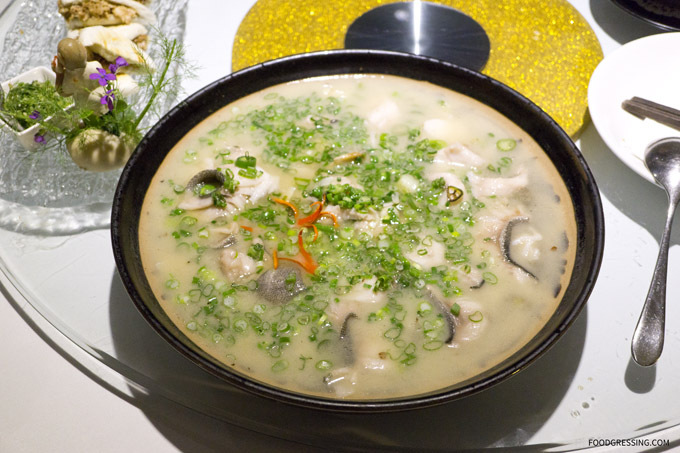 A definite must-have at Miura! 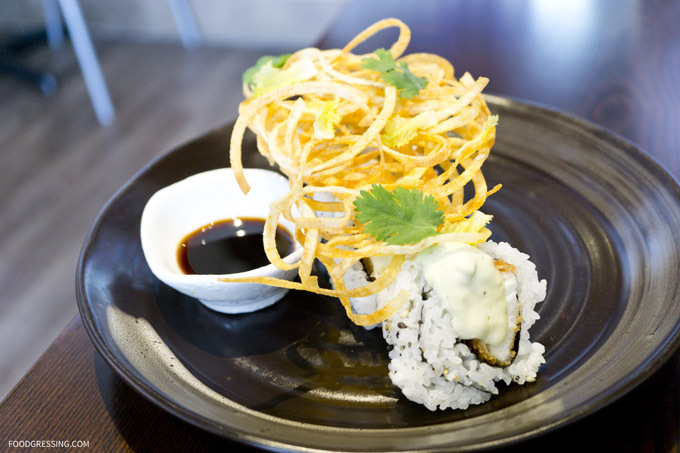 The idea of a fish and chips sushi roll ($7) is simply mouthwatering and the end product is just delicious. Where have you been all my life? Miura’s unique dish has fried halibut, gari wasabi tartar sauce, crispy potato, and garlic soy. I was impressed that they use a fatty fish like halibut which was also fried perfectly. 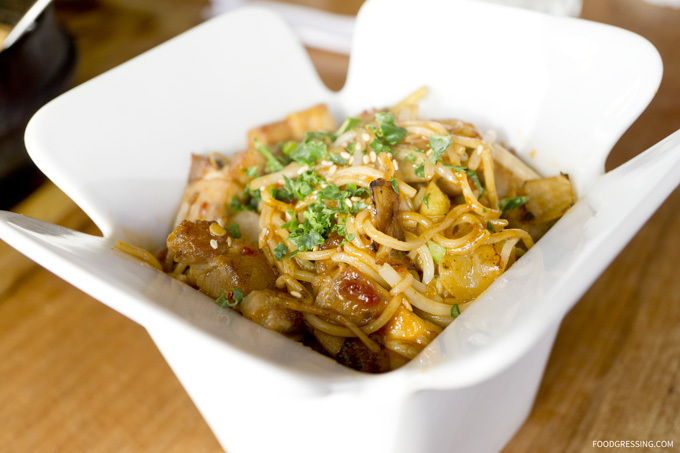 The rolls were stylized with elegantly placed twisted strands of crispy potato. The Morning Glory cocktail (grapefruit juice, sake, agave syrup, lemon juice and club soda) ($7) was fruity and refreshing. It’s cherry blossom season again in Vancouver! What an incredibly beautiful time in our city with cherry blossoms popping up in full force. I felt inspired for some sakura-inspired eats and immediately thought of Shizenya‘s Sakura Blossom Roll. 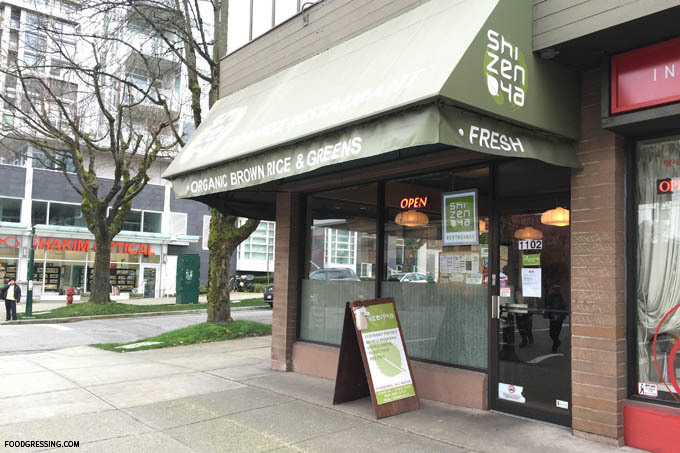 Shizenya has two locations in Vancouver: one in Downtown and one on West Broadway. I had been to the Downtown one years ago, but never to the West Broadway location. My husband and I visited Shizenya on West Broadway for a late lunch last week. 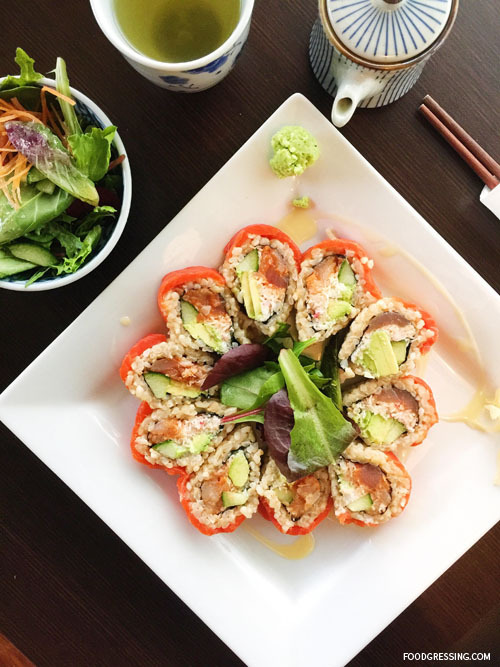 Shizenya is the first natural food Japanese restaurant chain in North America which serves sushi with only brown rice and organic vegetable. 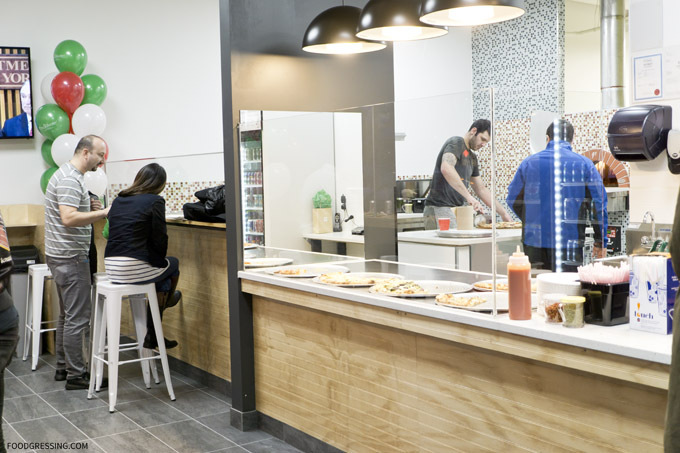 Their menu includes Japanese food with healthier ingredients such as brown rice rolls, non-oil teriyaki, organic green salads, quinoa cones, whole wheat tempura, and non-oil teriyaki. They also use Oceanwise seafood which is great for sustainability. Their menu is fully available on their website. We ordered the Sakura Blossom Roll ($13.95 for 10 pieces). 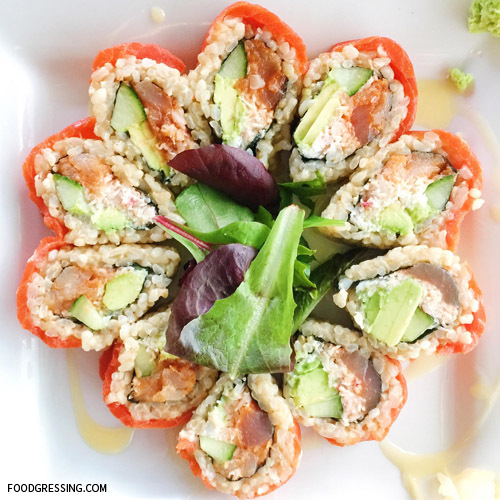 It had fresh real crab with mayonnaise, spicy albacore tuna, wild sockeye salmon, cucumber, organic avocado, organic brown sushi rice. The sauce was a creamy maple sauce with mayonnaise base. The rolls were arranged to mimic the sakura petals. The seafood tasted moist, fresh and delicious and maple sauce was sweet. This was very good. I would order it again. We also had the beef teriyaki combo ($9.95) with sukiyaki beef, teriyaki sauce, organic brown rice, spinach gomaae, and organic salad. 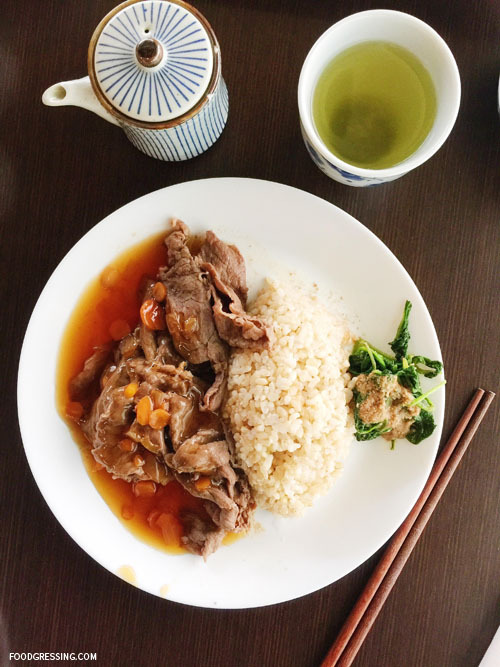 Tender beef and a sweet teriyaki sauce – the flavours went all went together. It was a hit with me. 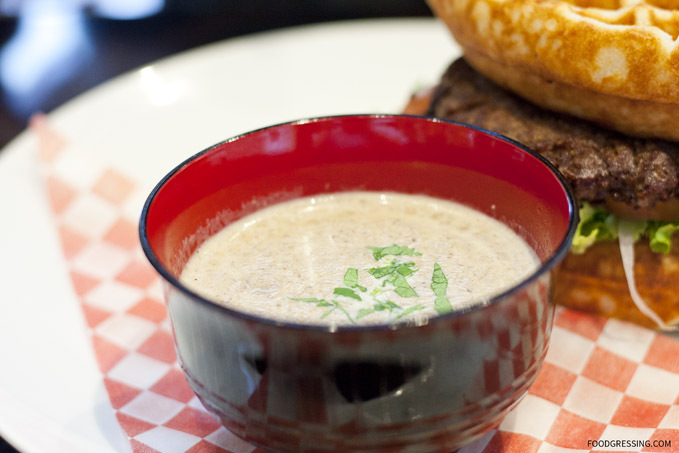 Prices at Shizenya are a bit higher than a conventional Japanese eatery in Vancouver due to the higher quality ingredients. For lunch, I would need a few rolls plus the lunch combo in order to be fully satisfied. I had previously had some positive dining experiences at Damso Modern Korean Cuisine on Denman (my rating = 4/5). So when the line up at Cafe Medina was estimated at two hours long, my husband and another couple decided to go for Korean. I recommended giving Damso’s second location on Bute a try and we headed there for brunch one Saturday afternoon. Damso on Bute offers a variety of comforting Korean eats including 24-hour slow cooked baby back ribs, kalbee osso bucco (braised short rib) and gamjatang (pork neck bone soup). The items typically range from $7-$15 dollars. One of their more unique menu items is the Korean taco with secret gochujang chili sauce. Zomato has photos of their menu. Damso on Bute is larger than the one on Denman. It is similarly cozy and quaint with lots of wooden accents. There is one large communal table, some banquette seating and small dining tables with wooden stools. 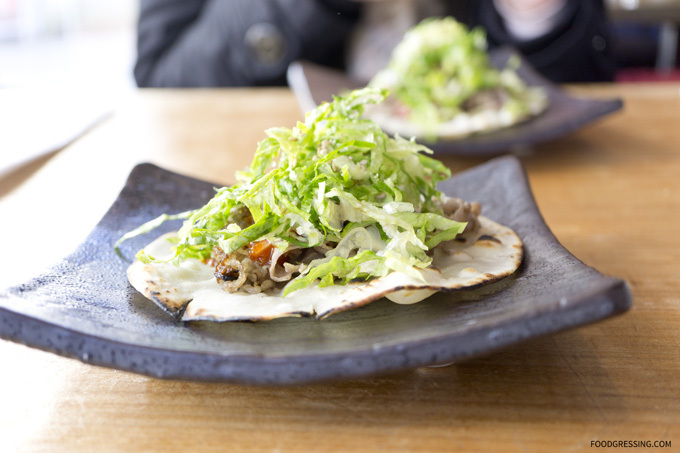 We first started off a korean taco ($2.50) in a handstretched tortilla, beef belly and chili sauce. I liked that the tortilla was toasted or grilled which made it crispy. 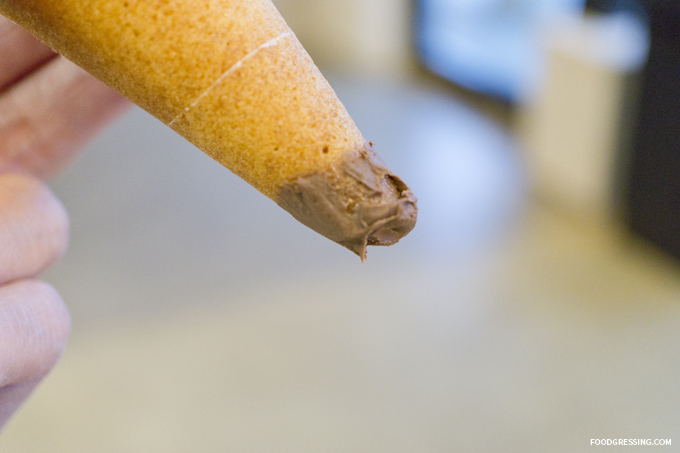 The filling was nice and flavourful. 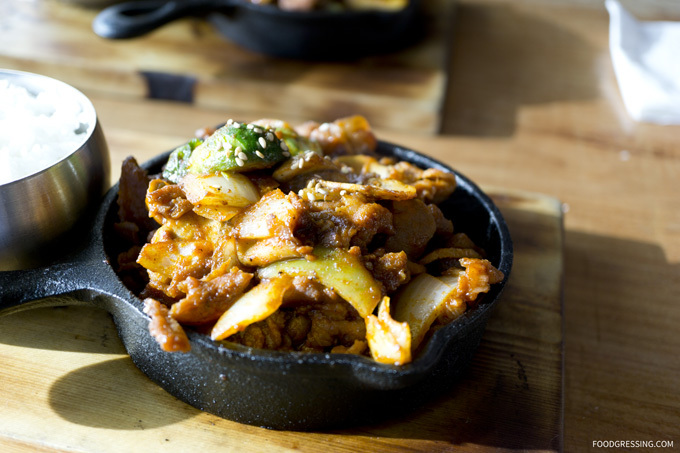 The spicy pork bulgogi ($8.99) was wonderfully sweet, savoury and spicy. It didn’t come with as many sesame seeds like at Damso on Denman. Flavour was on point and the meat was tender. 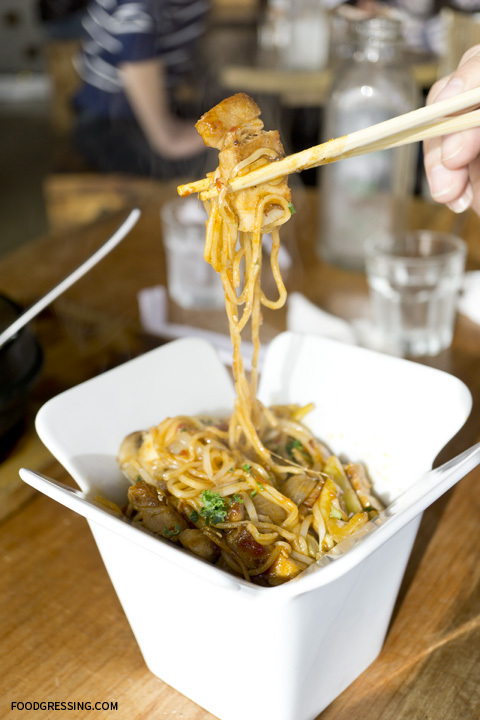 My husband had the Holy Sh*t Super Spicy Stir Fried Noodle with pork belly ($11.99). I had a dabble at the dish and it was on fire. My husband, the spicy food lover, quite enjoyed it. 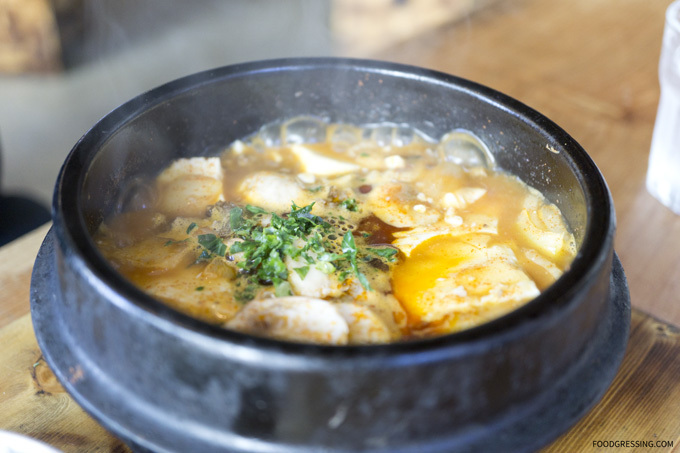 Our friend had the soft tofu soup ($12.99), which he regularly orders at Korean restaurants. He found Damso’s version to be hearty and overall tasty. One thing I noted, however, was that there was no side dishes. 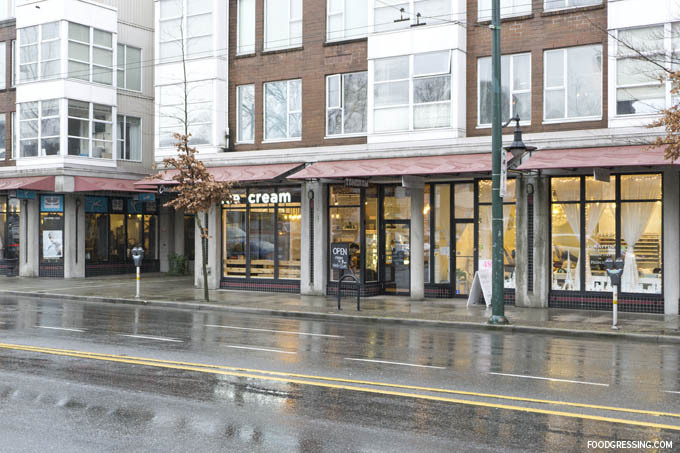 Faubourg Paris is simply known in Vancouver for their Parisian gourmet desserts in an elegant setting. 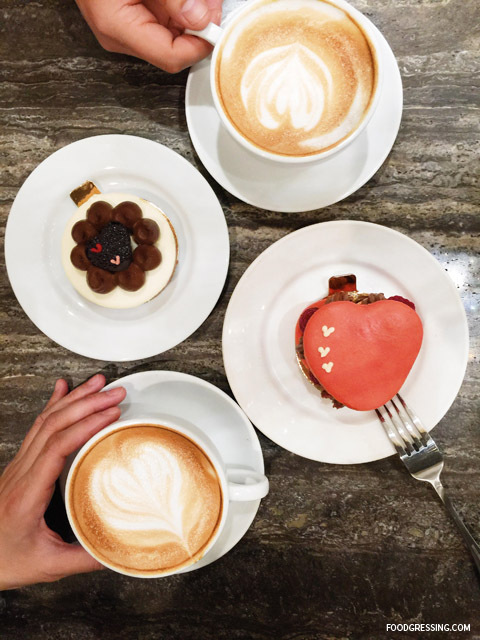 With three locations in Vancouver (Kerrisdale, Downtown and Park Royal), you can easily find a sweet treat at Faubourg to satisfy your craving. 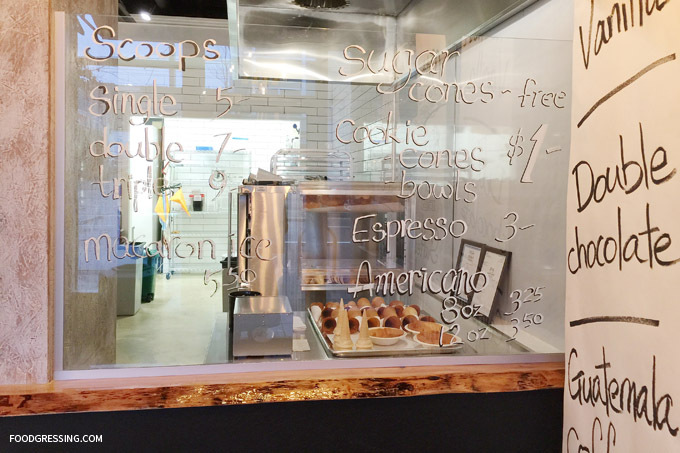 Their tasty offerings include macarons, cakes, signature pastries, viennoiserie, as well as bread and sandwiches. Faubourg has various promotional items, which are listed on their website. In particular, they have a special pastry and macaron of the month. 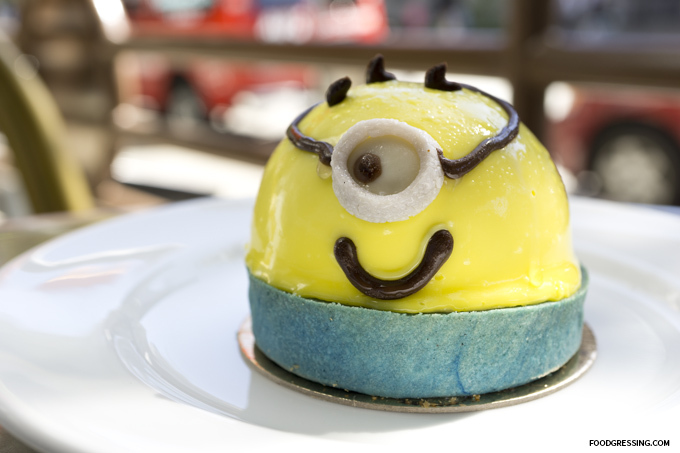 Last August, I bought the kids pastry of the month for my son which was a minion pastry. It was combination of vanilla Bavarian mousse and strawberry compote settled over sweet strawberry jam and fresh banana slices all placed into a tart shell. I bought it mostly for its novelty but I found the banana flavour to be very strong. 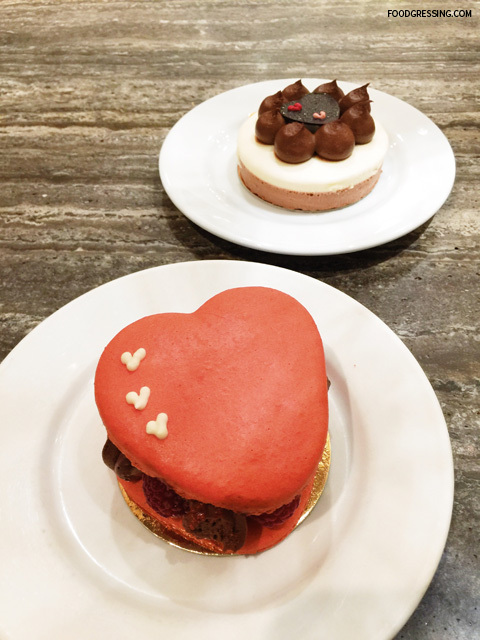 For a Valentine’s Day date, my husband and I got two lattes, a macaron heart and the tri decadent. 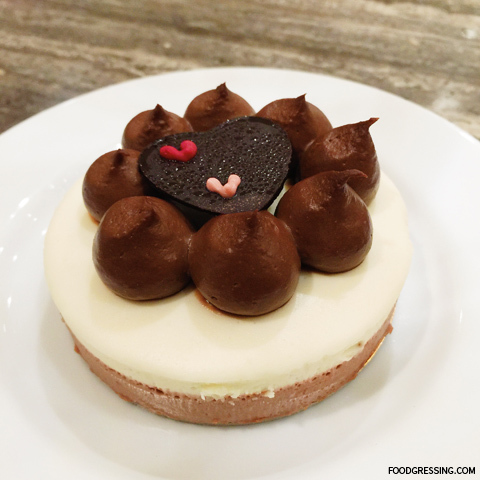 The macaron heart ($7.50) was filled with dark chocolate mousse, a salted caramel centre and fresh raspberries. It came in a prepackaged box (more about that later) but some of the chocolate mousse was lost from being stuck to the box. I very much enjoyed the tri decadent ($5.95) which had milk, dark and white chocolate mousse over a crunchy sablé breton. I would have to say the highlight is the sablé breton, a really lovely buttery cookie crust. If there is one thing that I think Faubourg could improve upon it would be the service. On the times I have been there, it seemed like the front staff consisted of pastry students. 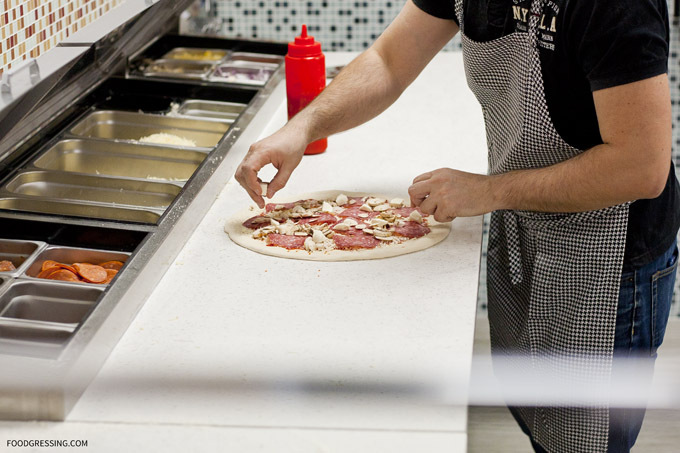 First of all, the service could be friendlier to match the chic and elegant setting. On my last visit, the macaron heart was pre-packaged in a box. When I told the pastry-chef-in-training who staffed the front that I wanted it for here, she handed me the box containing the macaron heart on top of a plate. I then spent a few minutes at my table carefully extracting the macaron heart from the box onto my plate. I think my experience would have been improved if she had made the effort to take the dessert out of the box and onto a plate. I also noticed the same pastry student clearing the dishes from tables but not actually given the tables a wipe. Next time, I’ll have to remind myself to bring a few wet wipes. 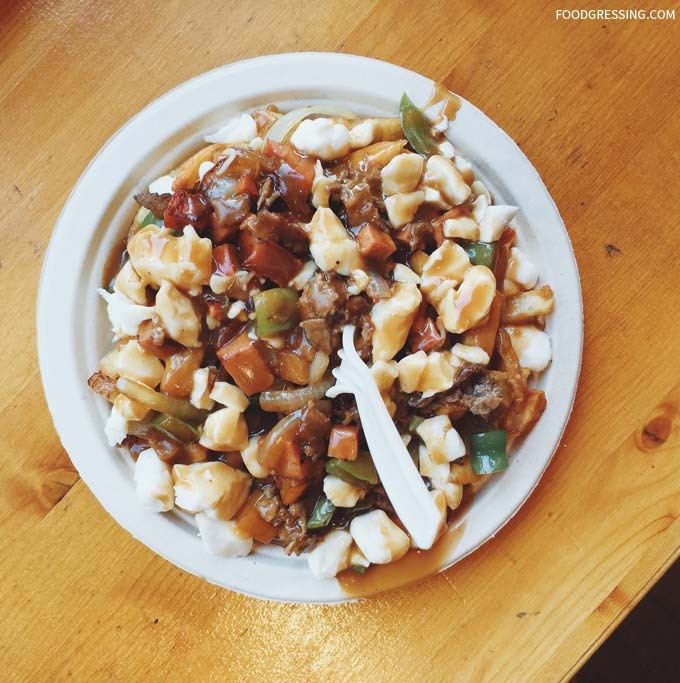 If you are craving poutine in Vancouver, La Belle Patate is one place to go in Vancouver. I have been to La Belle Patate a few times over the last few years, and in this review I’ll share with you my experiences with their comforting eats. 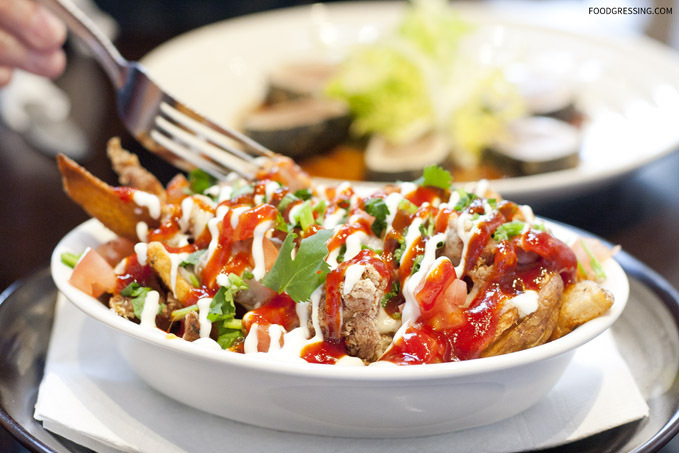 La Belle Patate’s tasty array of 26 poutines types includes 8 traditional and 18 speciality. 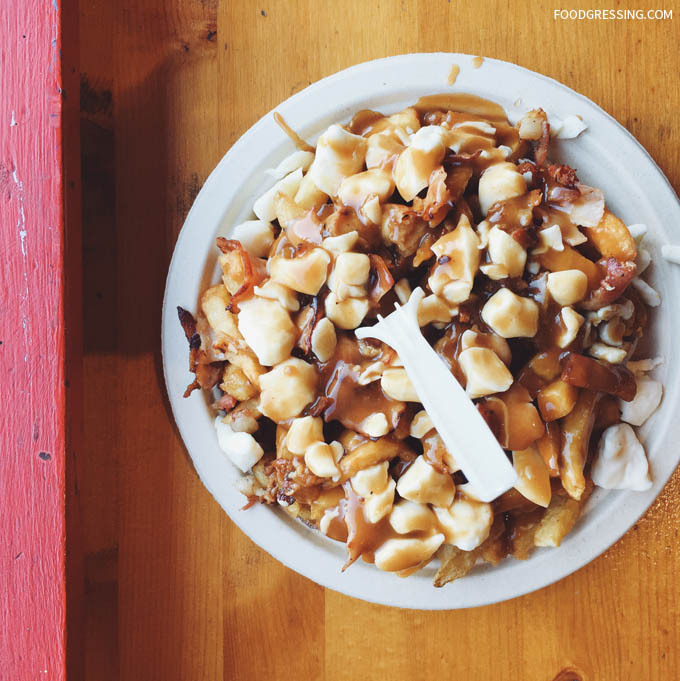 Just reading the names of the poutines makes your mouth water…bacon poutine, smoked meat poutine, and donair poutine to name a few. 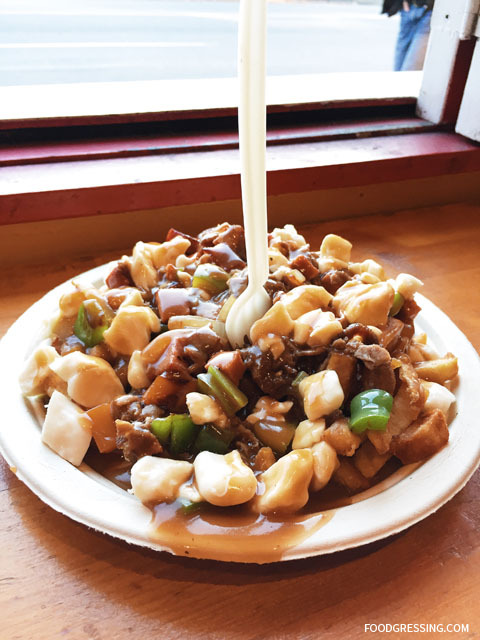 Poutines come in small, medium and large and range from $6 – $14 depending on the size. 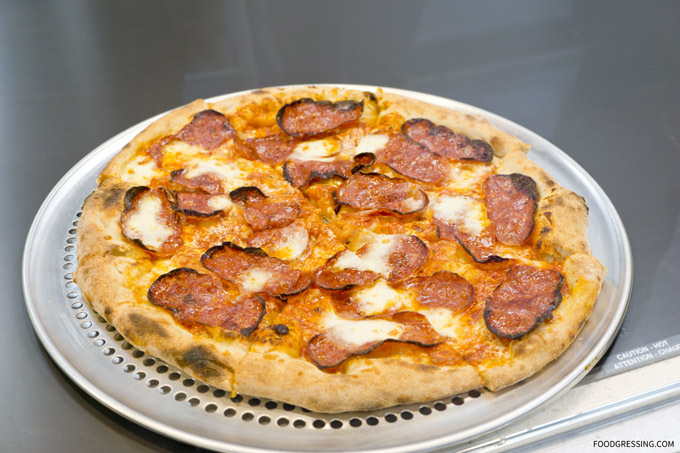 But if you want a truly indulging experience, you can go for the All You Eat option for $19.50! 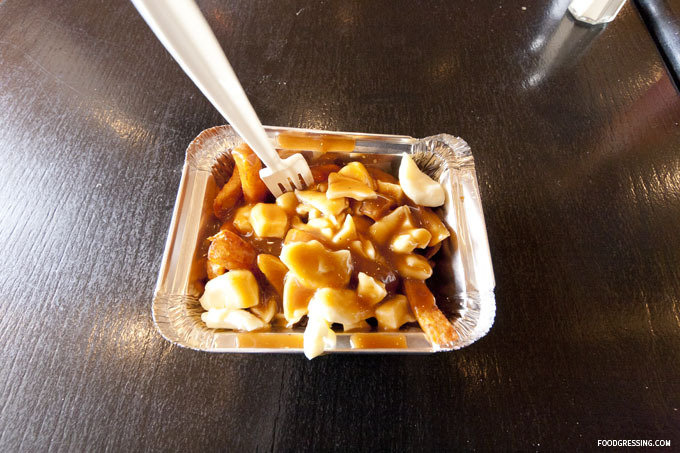 Personally, I would not be able to take in that much poutine but I do admire those who can. 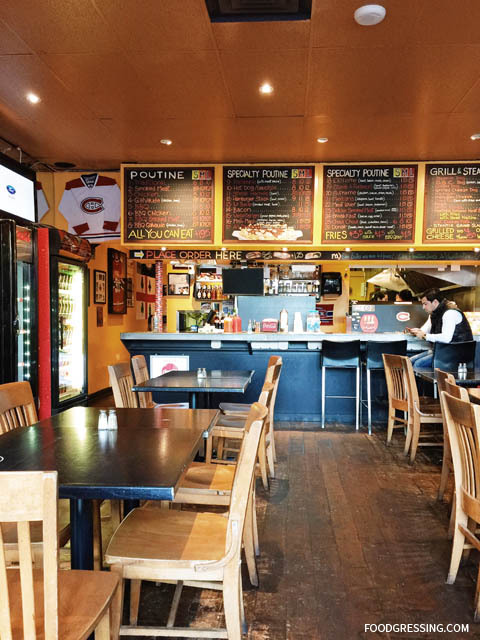 Aside from poutines, La Belle Patate also offers smoked meat sandwiches, grilled cheese and hot dogs. Their menu is available online. 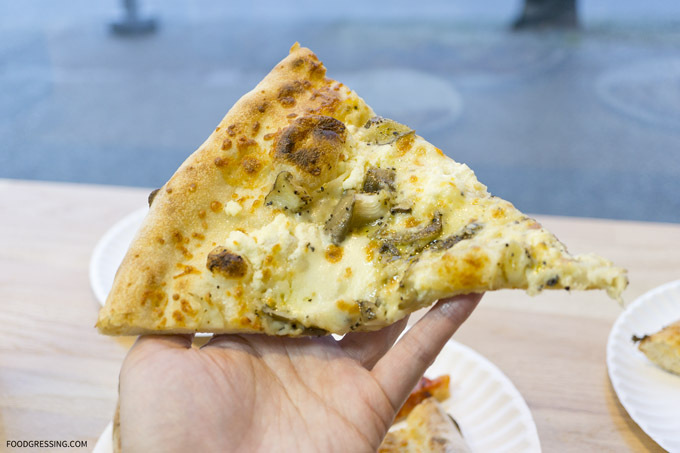 I first visited La Belle Patate a few years ago on an $8 Social Shopper offer. It was valued at $19 and included 2 small authentic traditional poutines and 2 classic steamies. 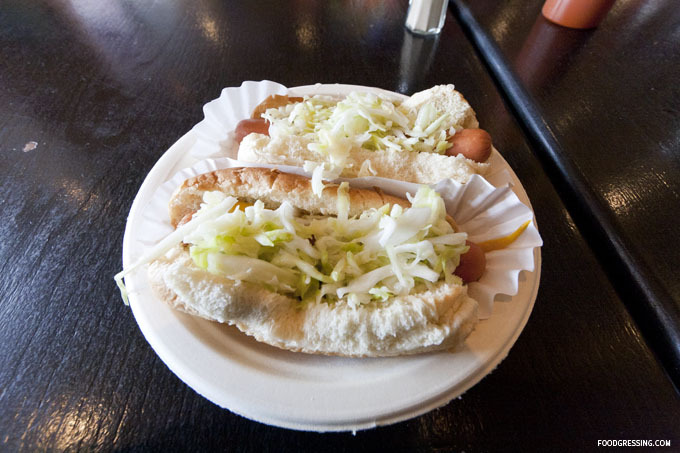 The steamies were basically steamed hot dogs in a steamed bun with mustard, onions and coleslaw on top – simple and tasty. The regular price is $2.50. The two small regular poutines were loaded with sauce, squeeky cheese curds, and overall very delicious. Recently, I visited La Belle Patate and used a 2-for-1 Entertainment coupon. 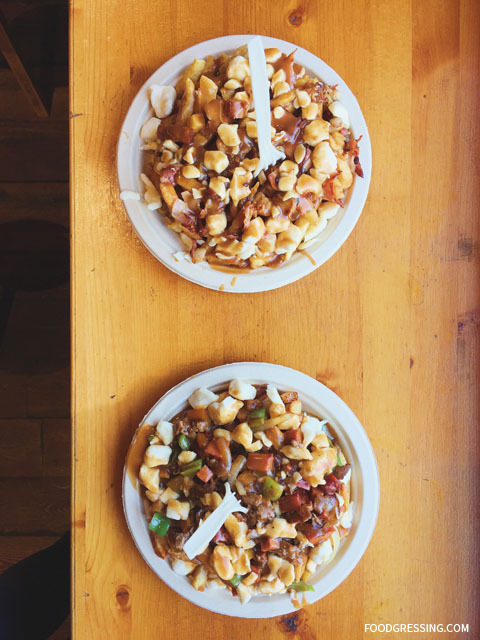 I got two large poutines: Meat Lovers (beef, bacon, and peperroni) and Maple (bacon and maple syrup) to share with my husband and son. The Meat Lovers was a bit smoky and savoury which was a huge contrast tot the Maple which was very sweet. After trying the Maple poutine, I would have to say that a sweet poutine is just not my thing. I prefer a savoury one for sure. 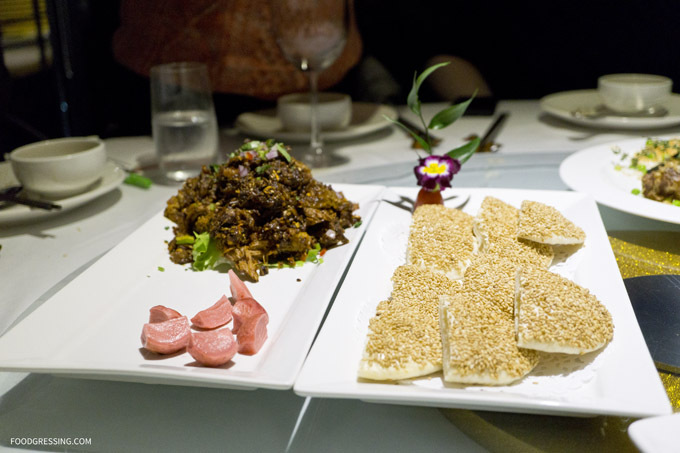 Last weekend, I attended a 10 course Chinese New Year dinner at Floata restaurant organized by Vancouver Food Lovers and Bloggers group. The cost of the ticket was very cheap: $25 including tax and tip. Given the price, I expected the meal to be filling though not spectacular especially given the ratings on Floata. I had a look at the menu beforehand and the 10 courses were pretty standard. 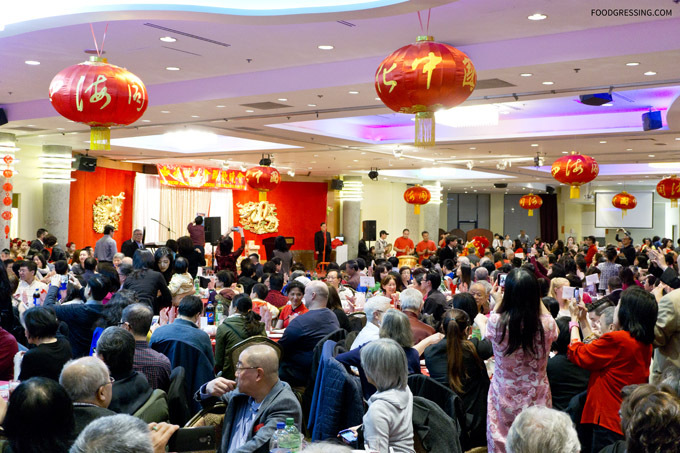 I decided to give the event a try and invited a non-Asian friend so that she could enjoy a Chinese New Year dinner as well. Floata Restaurant in Chinatown is probably one of the largest Chinese restaurants in Vancouver in terms of size. 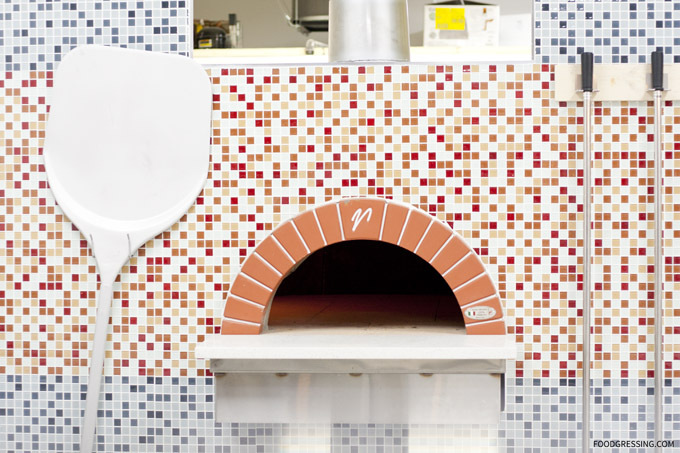 It is a 20,000 square feet restaurant that can accommodate 1,000 guests. 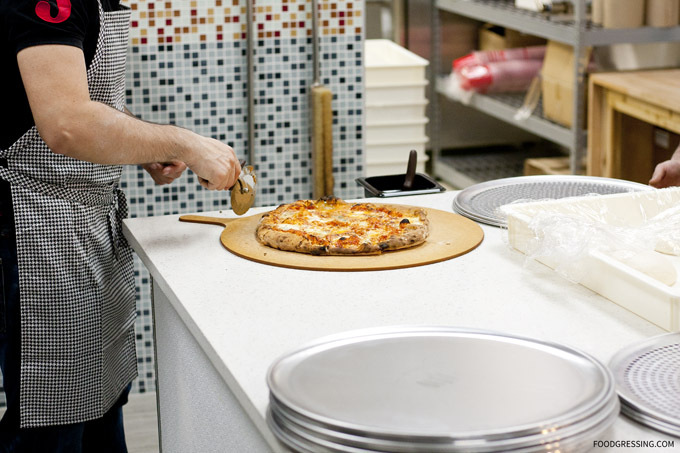 While they do serve lunch and dinner, their facility size makes it a prime location for banquets. 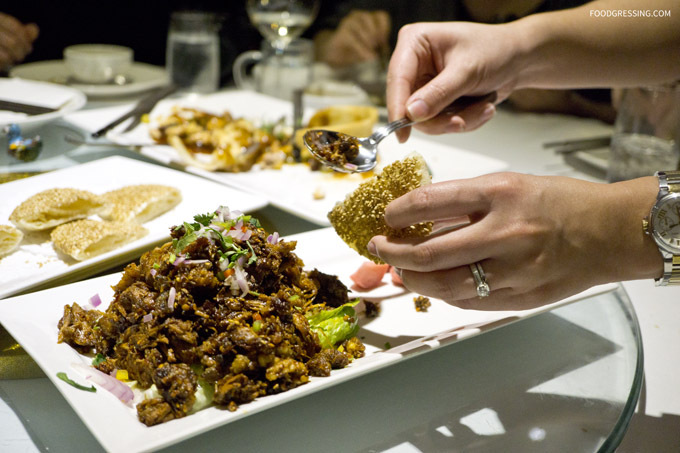 The Vancouver Food Lovers and Bloggers group secured a private room for about 80 attendees. The dinner started off with an appetizer BBQ combo platter followed by hot and sour soup. The hot and sour soup was way too spicy for my liking. 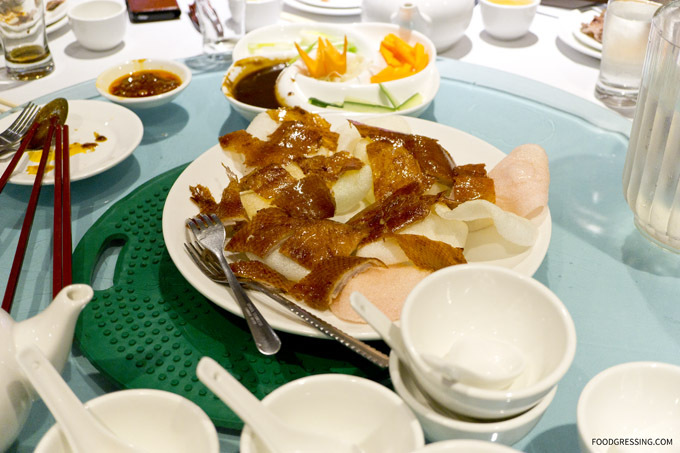 Next was the 2 course Peking duck. First was the skin with the flour wrap followed by the minced duck meat with lettuce wrap. 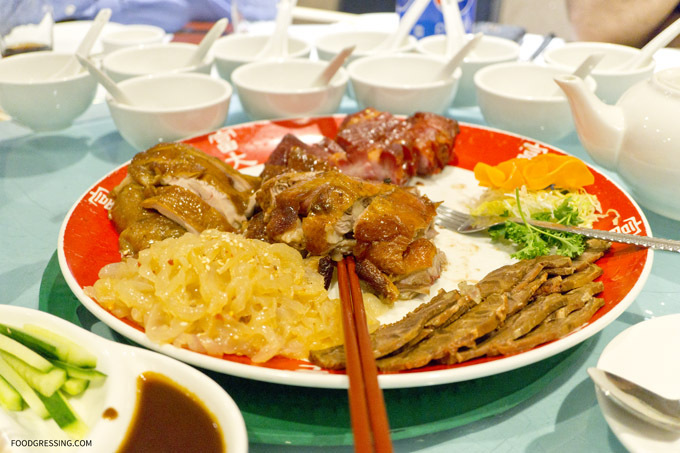 Given the cost of the meal, it is very likely that the duck was bought from a BBQ place and then refried – an obvious contrast to the fine dining methods of the duck dish at Chang’an. The two courses tasted reasonable. The pork chop in chili salt and crispy chicken were some greasy but still tolerable. 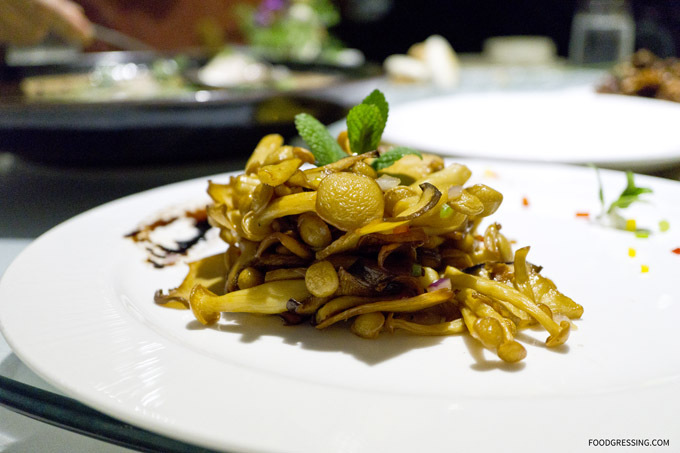 My favourite dish of the night was the baby bok choy and Chinese mushroom with oyster sauce. It was wonderfully saucy, hearty and comforting. The most decent tasting entree of the evening. The mushrooms and baby bok choy were nice in size. 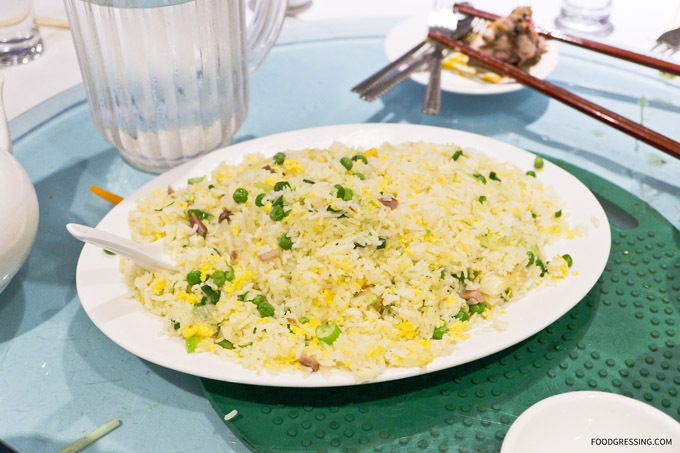 In contrast, the fried rice and fried noodle were mediocre. 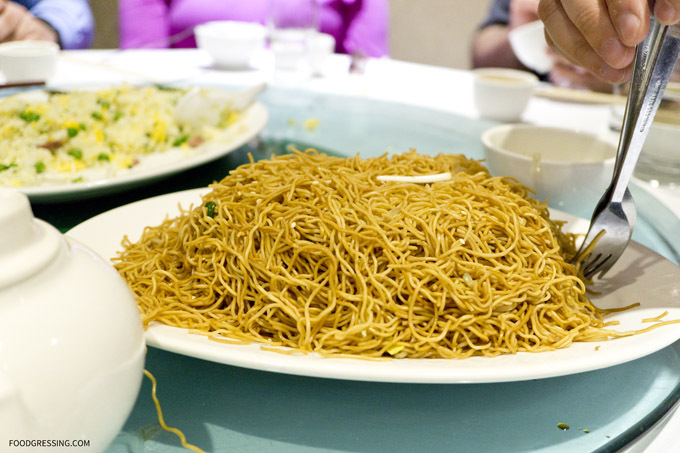 Both dishes were nothing more but rice and noodles really, with barely any other ingredients. The noodles were just cooked in soy sauce. 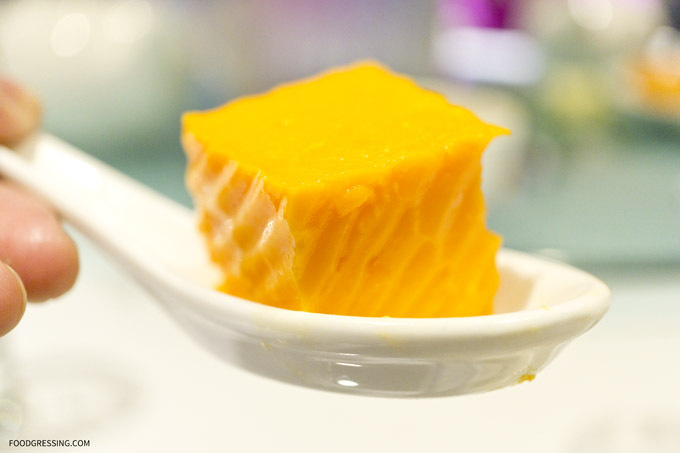 The dessert was simple – a cube of mango pudding on a spoon. Nicely chilled, the pudding had a good mango flavour. While the food may not be very impressive, I did find the execution of the meal to be on point. All the dishes came out in a timely manner and we were never left without food for too long. Floata certainly has these large scale events down in terms of service. 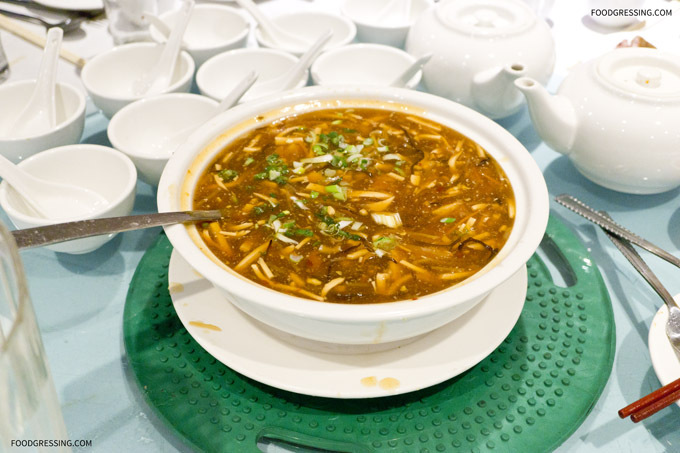 In Vancouver, it is well-known that there are many Chinese restaurants. But, where does one go for an authentic Chinese fine dining experience? 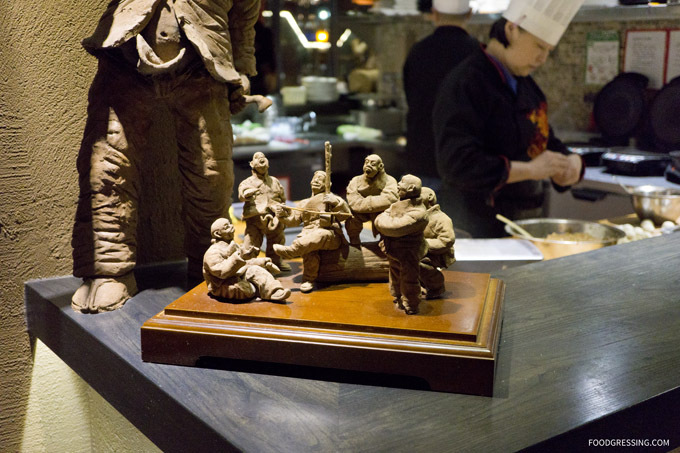 Located right on the waterfront of False Creek North, Chang’an offers customers Northern Chinese style cuisine from the Shaanxi province. 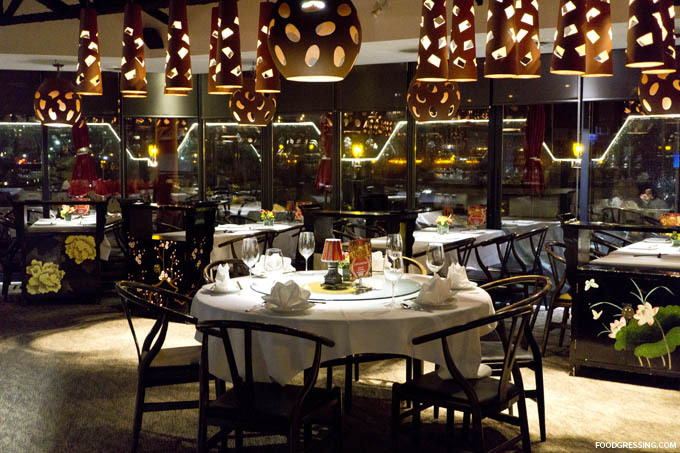 Chang’an has also received accolades locally as they were awarded “Best Fine Dining” by diners in 2015 for the Chinese Restaurant Awards. 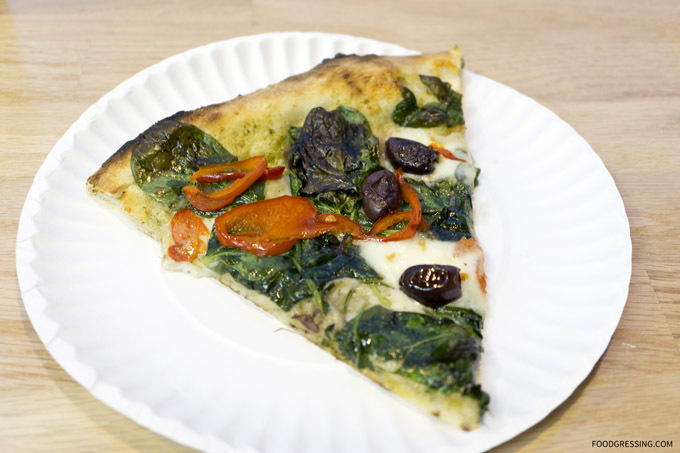 Disclaimer: All items in this review were complimentary. Opinions are my own. 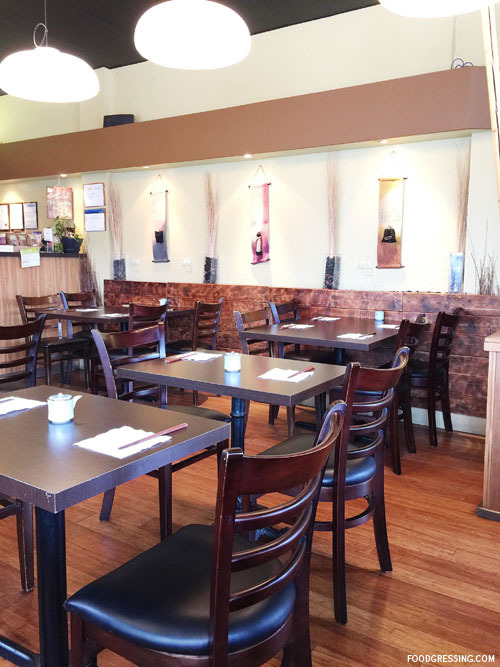 Chang’an is owned and operated by the China Folks Restaurant Group. While they own and run several fine dining restaurants in China, this location is their first foray into the International market. Their clientele are typically the wealthy from Mainland China. 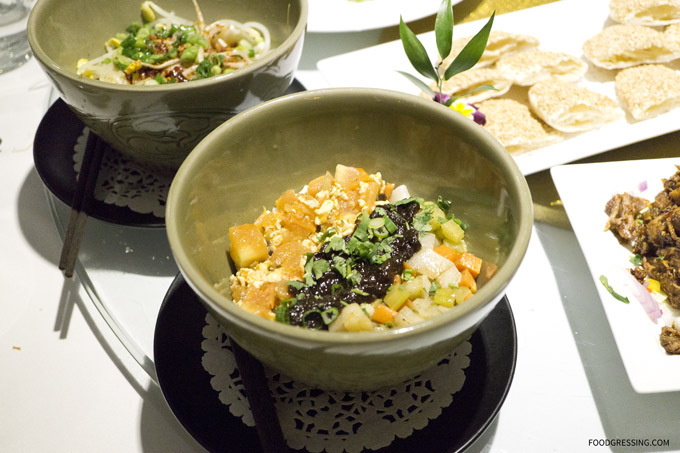 At Chang’an, noodles and vegetables dishes typically range from $15 to $22 while specialty plates are between $28 to $98. Last month, I was invited by Chinesebites.com for a menu tasting consisting of 21 dishes. 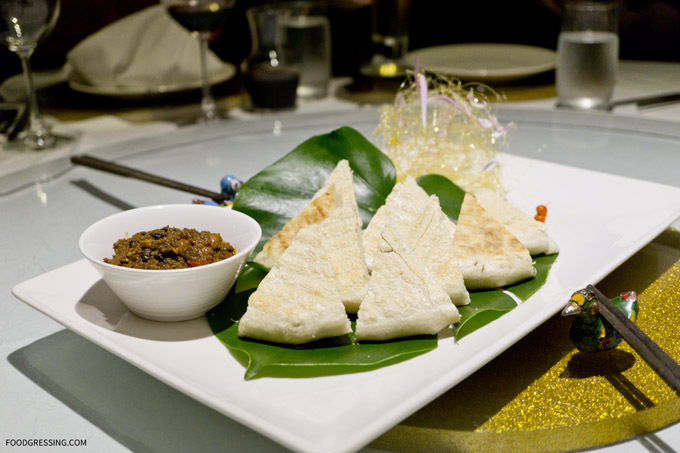 We started off with a bread appetizer – the guo kui pita eaten with a spicy bean mixture. 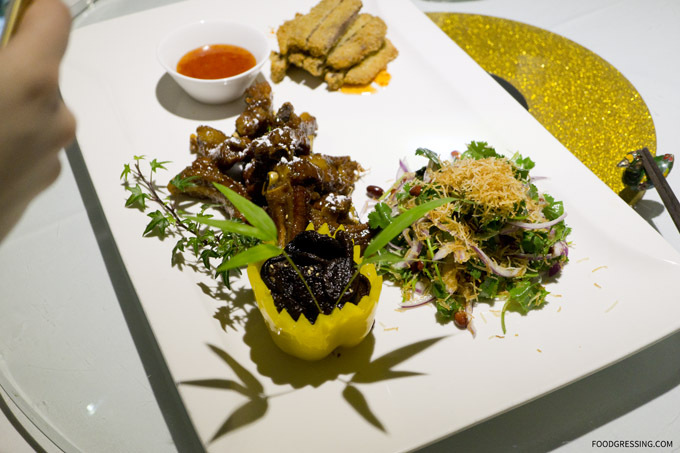 Next up was a four-item appetizer platter that included tossed cilantro, scallion and red peanut salad; marinated mushroom, crispy beef tongue, and honey grapefruit spare ribs. The marinated mushrooms were wonderfully flavourful while the salad was refreshing. The crispy beef tongue was the least appetizing with it being too oily. The spare ribs fell nicely off the bone and had a nice sweet and sour taste. 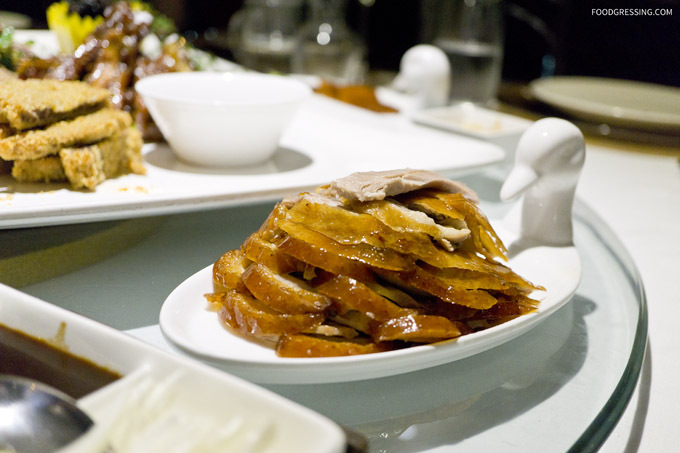 The Chang’an Roasted Duck, a signature dish, was a real treat. It is a reservation-only dish using Grade A ducks which are processed for 72 hours and roasted in-house for over an hour. Chang’an is not taking shortcuts compared to most restaurants that purchase their ducks from BBQ shops and just re-fry them prior to serving. 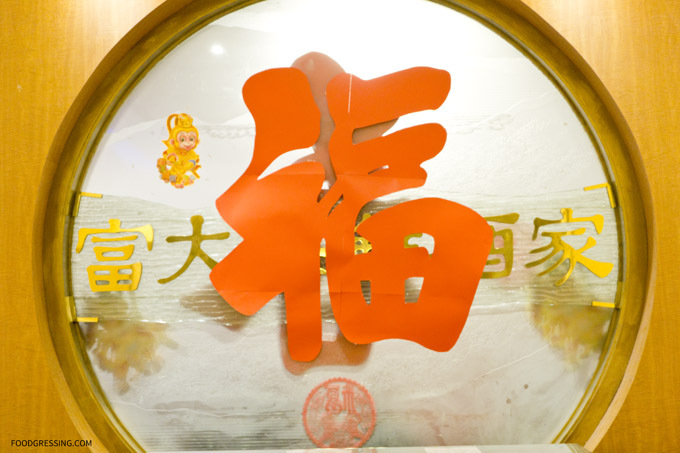 Chang’an schedules the cooking process according to your time of reservation to ensure optimal tenderness of the meat and crispiness of the skin. 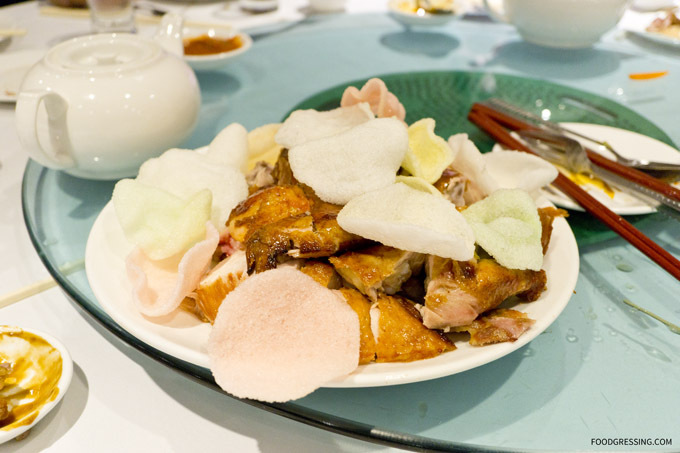 The duck skin is eaten with brown sugar while the duck meat is eaten with hand-made flour wrappers and sides like hoisin sauce with cucumbers, strawberry sauce with pears. A truly magnificent and delicious dish. 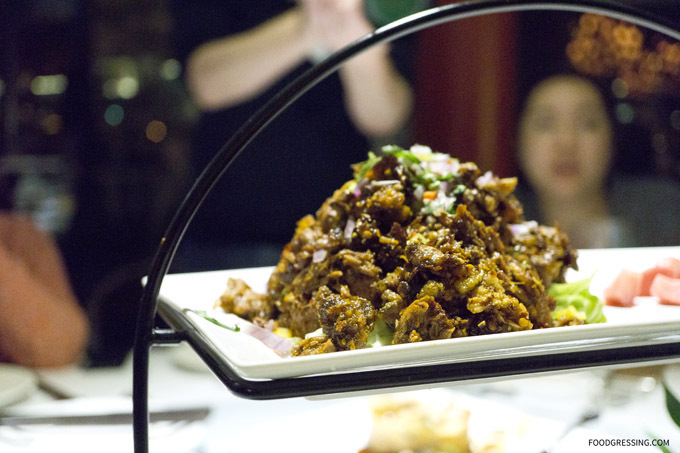 The second course of the roasted duck was the 5 spice duck ribs. The braised cucumber was an delicacy that I very much enjoyed. 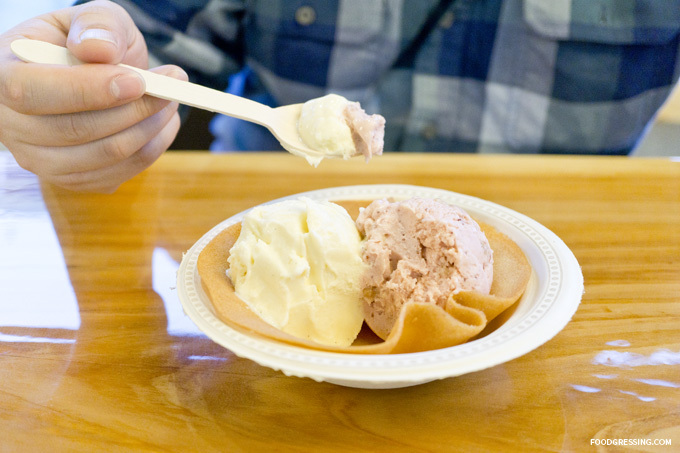 The appeal in this dish is in the texture rather than taste – which is somewhere between firm and jelly-like. 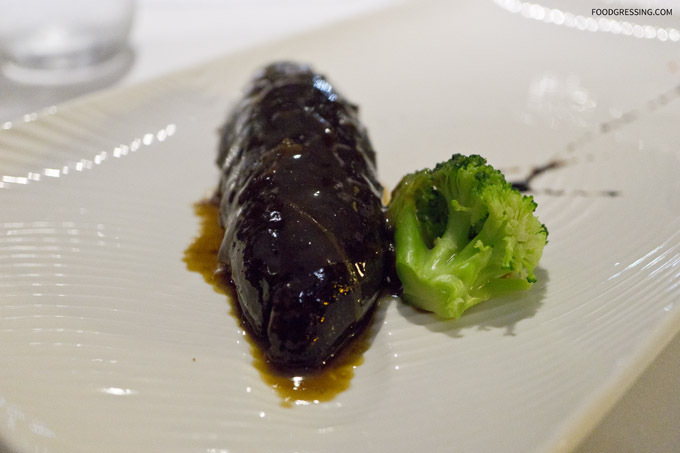 The sea cucumber was braised for 48 hours with 20 different herbs and spices. At $50 a dish, the braised cucumber was a fine indulgence that I would gladly have more of. The Imperial sweet and sour soup was fit for royalty. 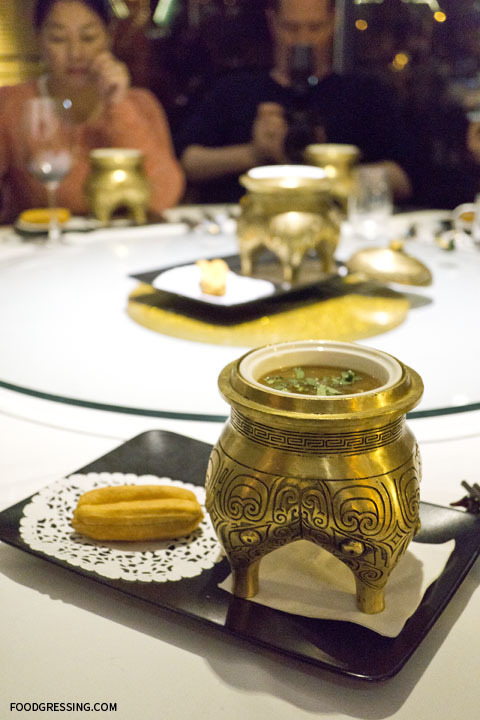 Presented in an tall golden bowl, the soup definitely had fire under it such that it was a bit overwhelming for me. It was served with a Chinese donut that was very chewy. 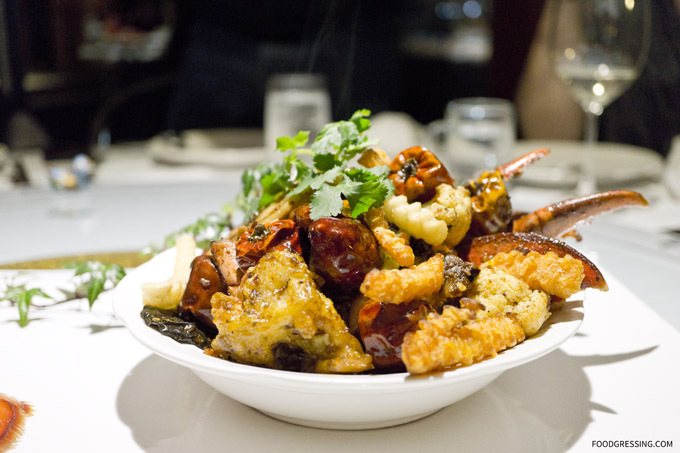 The house fried chili lobster was most definitely mouthwatering and came with a surprising side – crinkle cut fries! The lobster meat was tender and was easily extracted from the shells. 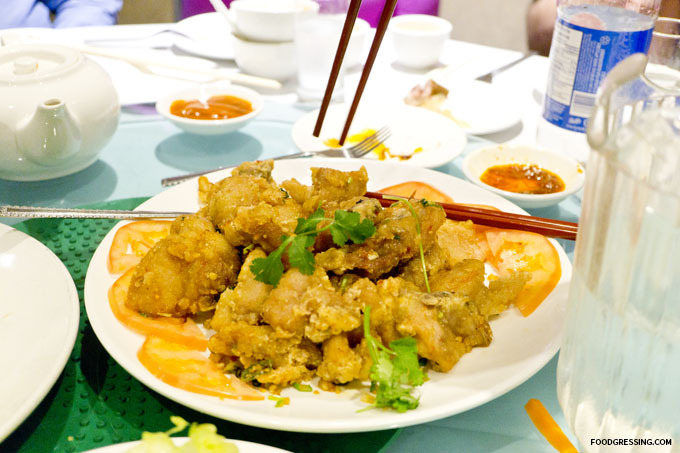 The Chang’an Gourd Chicken was a wonderfully crispy deep-fried delight. 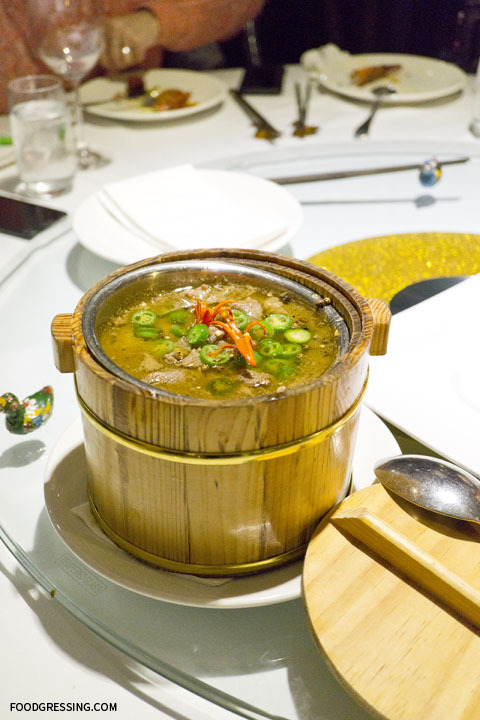 The Szechwan Peppercorn Sliced Beef was served in a stainless steel bowl within a tall wooden vessel. A spicy and flavourful dish with tofu noodles. 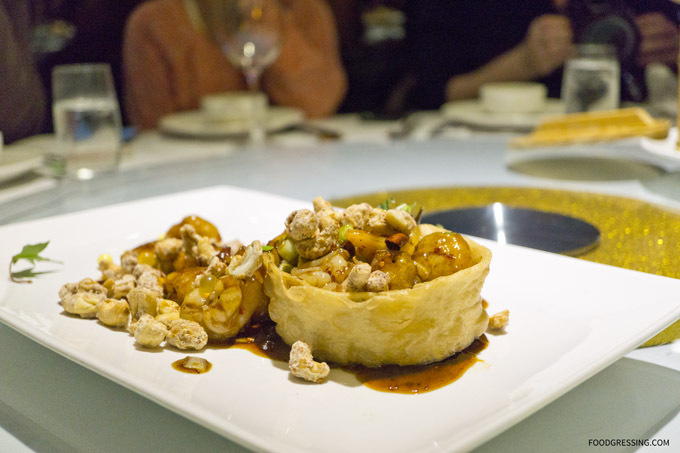 I loved the flavours of the Sweet & Sour Lychee & Prawns in a puff pastry. I thought that they lychee flavours really came through. I would have not thought of it be such a delicious pairing with prawns. 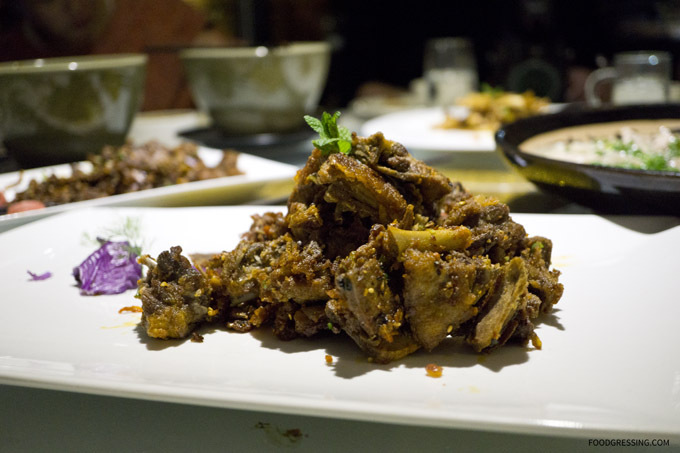 The Qin Style Roast Lamb Leg was another favourite of mine with tender, flavourful meat. Served on a two-tier plate stand, it was a comforting dish. 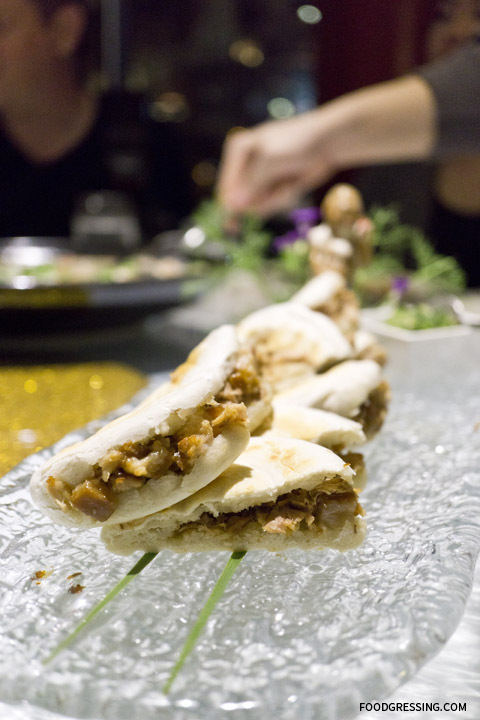 The meat was eaten with a crispy flatbread pocket with sesame seeds. The next two were noodle dishes. First was the Three Sauce Noodle with minced beef, tomato, egg, celery, carrot, potato and tofu. This was followed by the Biang Biang Noodles, with thick noodles and Shaanxi special hot chili sauce. Both were good but nothing too memorable. The Braised Whole Chili & Spring Onion Cod was a surprising hit. The cod meat was melt-in-your-mouth good while the broth was pleasantly spicy. The Pork Belly Mini Sliders were presented in a long dish with a Chinese figurine. The pork belly was stewed in slow heat in a sauce containing over 20 spices and ingredients added to it, such as clove, nutmeg, ginger and cooking wine. 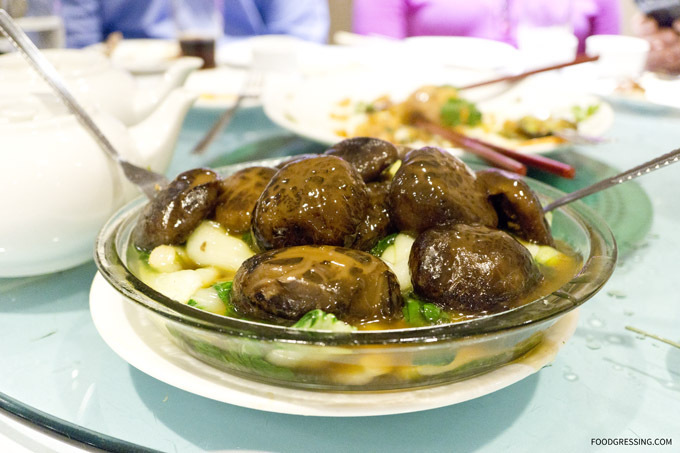 The King Mushroom Casserole was an elegantly presented dish that was simple in flavours but still delicious. 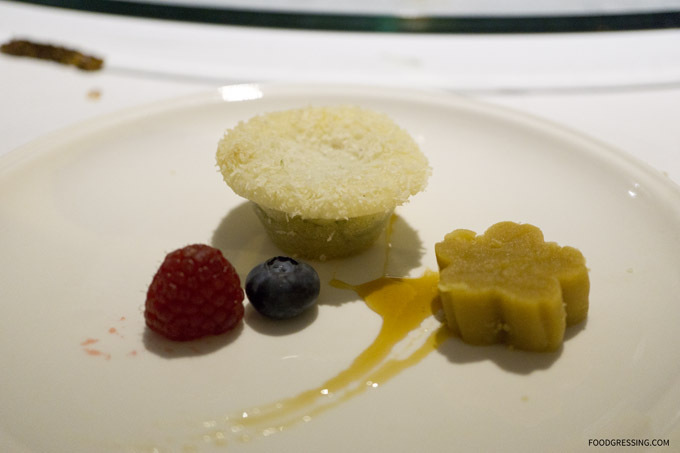 To finish off the feast, we received what I would call Chinese petit fours: yellow bean cake and red bean cake. Both cakes provided a lovely change of taste from our flavourful dinner.